More than three quarters of a billion euros have been raised for the reconstruction of Notre-Dame. Just 36 hours after Paris' iconic 12th century cathedral went up in flames, the pledges are coming in from billionaires, governments, and even other countries. Now, French President Emmanuel Macron has vowed the rebuild will take less than five years. "I`'m telling you this tonight with force, we are a people of builders," he said in an address to the nation on Tuesday night. "We have so much to rebuild, so yes, we will rebuild the Notre-Dame cathedral, even more beautifully, and I want this to be done within 5 years. We can do it and here again we will mobilise." The medieval roof and spire were both burned away, and authorities now say that the entire building was only 30 minutes away from complete destruction. The iconic spire will no longer be a part of the city skyline. The 'forest' of wooden beams in the roof, some from the 13th century, have been burnt to cinders. And for the people who live in Paris, they'll now see the badly damaged church every day. Anelise Borges has been speaking with Parisians about how they're feeling. 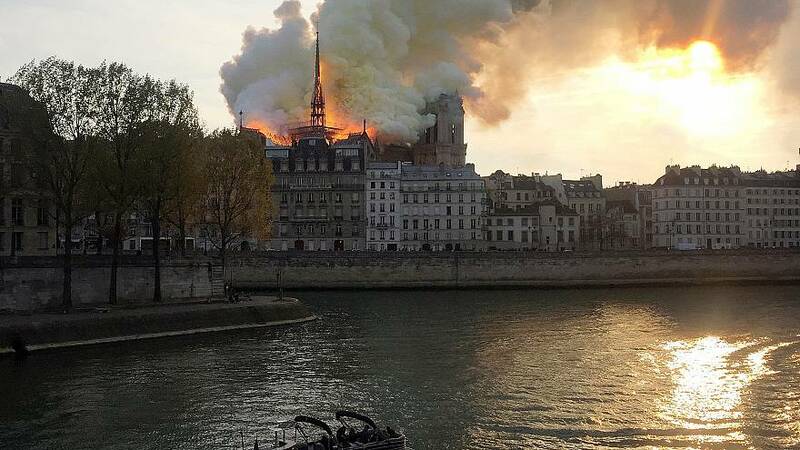 “I saw flames starting to cover the Notre-Dame, said Roberto Pintado, whose apartment windows look out at the cathedral. Standing by the Seine looking up at the church, Parisian Guillaume Nani took in the new look of the 850 year old building. “It reminded me of an event that happened when I was 10, an event that shaped not only France but the rest of the world - the World Trade Center attacks,” he said.